The farms’ annual May Day celebration was a great success with hundreds of visitors enjoying the sun and a wide array of activities. We raised a massive £1400. The day included the launch of our new ‘Food For Thought’ project led by Tricia Bojang, which is funded by The National Lottery and will include gardening and cookery sessions for local families. We rely on volunteers to help run all our events. So a big thank-you to everybody who helped make May Day such a success. 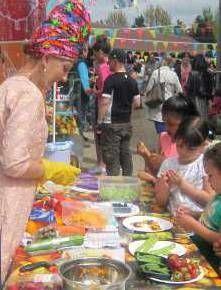 If you would like to get invoved please call Simone on 020 7916 5421 or e-mail simone@ktcityfarm.org.uk.